Collection litigation can refer generally to either consumer or commercial (i.e., business) debt. We concentrate on Accounts Receivable Collection Litigation, also known as Commercial Collections. This means lawsuits to recover business to business debt, such as unpaid invoices and commercial loans. The common thread in all collection matters is an alleged breach of contract. In other words, two parties enter a contract for the sale of goods or services, and if the buyer fails to pay, the seller holds it in breach (the same theory applies if a borrower fails to repay a lender). As a creditor, you generally want to keep the issues as simple as possible—to wit: You sold your product or services, you didn’t get paid, therefore the customer is liable. It’s very important, therefore, to keep records of all your communications with the debtor, such as emails and other correspondence, so the customer can’t manufacture facts later when you sue for nonpayment. See discussion here regarding the need to keep copies of all correspondence (internal policies to maximize debt recovery). successor liability – where instead of paying you, the owner forms a new corporation, continues his business and leaves you to go after an empty shell. 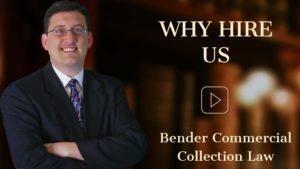 In these situations, an experienced commercial collection lawyer should be able to recognize such issues and effectively pursue them. New Jersey law requires corporations and limited liability companies to have an attorney in court. So if you’re incorporated, you’re required to have a lawyer. 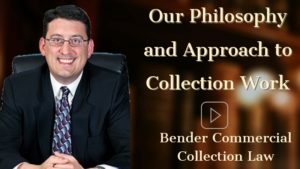 A skilled commercial collection attorney should have a trained eye to spot important issues that often come up in B2B collections. For example, in cases that involve fraud, fraudulent transfers or successor liability, etc., the difference between recovering and not recovering may turn on whether your attorney knows what he’s looking at, what he’s looking for, and what to do about it. At some point, most businesses that sell on credit will have unpaid receivables. Yet the decision to sue is not always simple. Keep in mind that the goal of business collections is to recover money, not to throw good money after bad. Therefore the first, fundamental question is whether the customer is still in business. Can you approach the customer directly, without a lawyer, in order to get paid and still preserve the relationship? If you have to file suit, what are your prospects for recovery? Maybe your customer just needs a friendly reminder. Or maybe things are a little slow, but the customer still has every intention of paying you. Unless you believe the customer can’t or won’t pay you, start off with the soft approach before going legal. Involving a lawyer will just burn your bridge, and a generally good customer will never do business with you again. Before involving a lawyer, consider sending a friendly reminder that may result in payment and preserve your relationship. See discussion here regarding our complimentary Due-It-Yourself letter form. If you need to get a lawyer involved, your lawyer may be willing to just send a demand letter for a modest fee. If the customer then pays you, you can save the larger legal fees involved in filing suit. See discussion here regarding our flat-fee collection attorney demand letter service. If the customer still ignores you, you probably won’t get paid without a lawsuit. As to the prospects for recovery, maybe the customer’s having financial trouble, maybe not. But if the lights are still on and the phone still rings, assume the customer’s paying someone – give it a reason to prioritize you. Be aggressive, be the squeaky wheel that gets the grease. The fact that it’s in business doesn’t guarantee you’ll get paid, but it’s a good starting point. Coupled with good internal credit and collection policies, it’s usually worth suing under these circumstances. See discussion here regarding proper internal credit and collection policies. If the customer is out of business, then your prospects for recovery are much lower. You could sue the customer and get a default judgment, but the judgment would be worthless if there are no assets to satisfy it. There might still be some assets, but the likelihood goes down considerably. Absent remaining assets or personal liability, if the customer is no longer in business, it’s usually not worth suing under these circumstances. But when you engage us, you let us worry about getting you paid. And we’re confident that we can help you recover your debt. We’ve honed our craft and gotten results for years. We concentrate on Accounts Receivable Collection Litigation and have been helping creditors like you recover unpaid invoices and delinquent accounts for over 20 years. Whether you’re a supplier of goods or services, a commercial lender or in another industry, you can get back to the business of making money, knowing that a skilled, experienced collection lawyer is working to recover what’s owed to you.